The Home Partnership were asked to help promote Madelayne Court by Runwood Homes Christmas Market on Saturday 19 November 2011. Our for sale signs were tweeked by our in-house designers to create enough room to promote the event which stated the date and times for passers by to see along with emailing the event to our mailing list and posting a feed on our social media pages, Facebook and Twitter. We would welcome hearing from anymore Schools, Care Homes or Charities looking for similar local support. However, we unfortunately cannot support every good cause but would welcome any suggestions for consideration. Proud sponsors of Writtle Infant School's Ice Rink and Xmas Bazaar on Saturday 19 November 2011. Sadly there was no dancing on ice for The Home Partnership!!! 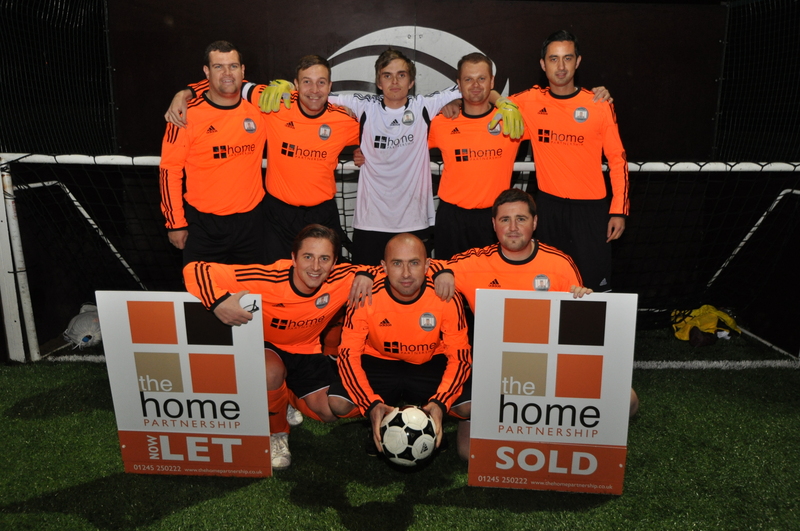 We are pleased to announce our sponsorship of The Repeat Offenders 5 A-Side football team who apply their trade on a Tuesday evening at Future Soccer in Sandon. Well we completed our charity run 'Race or Business'on Wednesday 22 June in which we managed to raise over £500 for Little Haven Hospice. We would like to say a big thank you to all those who supported and sponsored us. We were the proud sponsors of Great Baddow Kings Head for two successful seasons 2007/2008 and 2008/2009. During these two seasons as the clubs sponsors they won back to back league promotions as champions from divisions 3 and 2 of the Sunday Pope & Smith league as well as adding the division 2 league cup to their achievements.